Yvette van Boven » Another one! 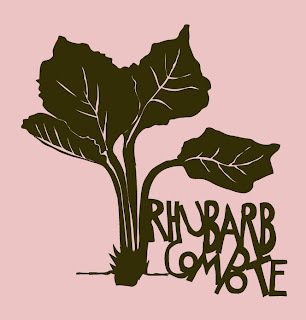 I Posted another recipe and drawing for rhubarb at Pia’s. Have a look quickly > HERE! The sweet and sour compote works really well in combination with the fresh and creamy taste of hangop. 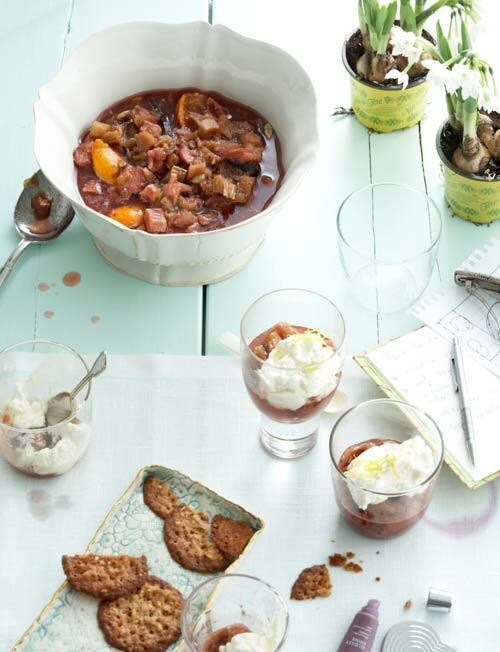 Fill a large baking tin with the rhubarb, sugar, cinnamon, cardamom and vanilla pods and seeds, mix well. Half the clementines, squeeze them over the rhubarb and tuck the peel in too. Cover with aluminum foil. Bake for about 30 minutes in a preheated oven at 180 ° C. Turn the rhubarbmix over so now and then. When cooked, take out of the oven and leave to cool completely overnight. This also marinates your compote, but you can eat it right away if you cant wait. Meanwhile, spread a clean tea-towel out over a sieve. Put the sieve on top of a bucket or big bowl. Pour the yogurt in it and cover with a sheet of plastic film. Put the whole thing away in the basement or in another cool place in your house for a night or even longer. The following day: beat the cream with the vanilla, the lemon-zest and sugar. Mix the yoghurt from your sieve (it will be stiff, like fresh cheese!) carefully with the whipped cream. Remove the spices from the compote. Fill eight glasses halfway with the compote and spoon a big dollop of hangop on top. Serve immediately: you will be thrilled!